It's the rainy season here, but as with all things climate-related, the weather isn't behaving as it ought to. The rain normally amounts to an afternoon shower, often a quick downpour, which is most welcome in the intense heat, but I went three days without a drop of rain and when It finally did rain it was well after dark. 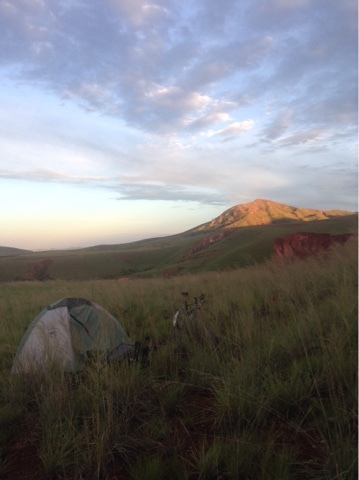 I was camped on a plateau without a human habitation in site, my most isolated campsite yet. For once I didn't have to restrain a yelp of pain when I was struck by a cramp, as often happens in the first days of a tour as my body becomes conditioned to the effort of the daily dose of six or seven hours of exertion. After a spectacular sunset I was treated to a lightning and thunder fest in a distant corner of the sky for a couple of hours. It was far enough away I didn't feel a concern of it bringing any precipitation. But shortly after I slipped into my sleeping bag a vicious wind whipped up pushing in one side of my tent. This is also the cyclone season. I sure hoped this wasn't one. I had no idea what the wind-rating of my tent might be. There were rocks around but I feared if I went out to gather them I might lose my tent. So I just hunkered down and hoped for the best. Several minutes later the wind relented and down came the rain, but not too harsh nor too prolonged. If I hadn't had food in my Tupperware bowl I would have set it out to collect water, as water is still a challenge to come by,or at least in enough abundance for washing. Food is not such a challenge as through every village there is an array of women with a tray of small fritters for sale. Evidently the locals buy them in small quantities and plop them straight into their mouth as when I ask for five they invariably have to scramble to find a scrap of newspaper or plastic bag to wrap them in. I now try to have a plastic bag at the ready. The standard price is 100 Ariary for one. With 3300 to the dollar, that prices them at three cents. Along the main national highway I biked for one hundred miles before turning off to the coast, the road was dotted with stands selling produce and other items. Apples and oranges and melons would be stacked in eye-catching pyramids. One stretch had model trucks mounted on racks. 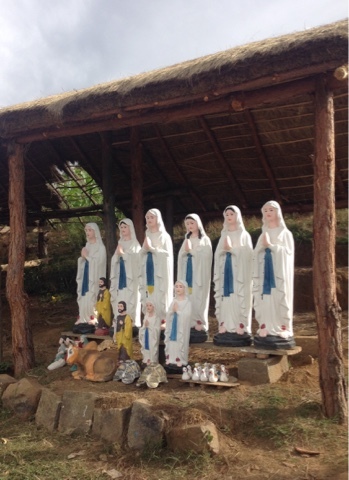 Virgin Mary's were also for sale. Forty per cent of the population is Christian, with fifty per cent adhering to local traditional religions and just eight per cent Muslim. 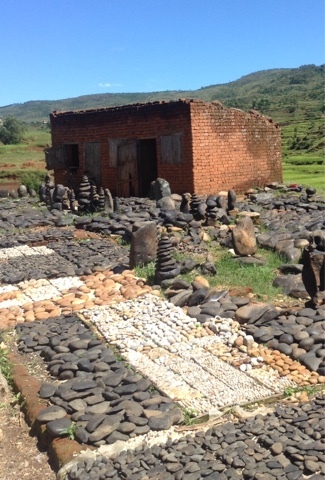 One stretch along a river had river rocks for sale. The road off to the coast is so lightly traveled there was no such enterprise along the road, only an occasional bicycle pump tended by a young man sitting in the shade or sometimes by no one at all, just perhaps someone monitoring it from the nearby habitation. One could get some air for 100 Ariary, the same price as a fritter or a banana. As I sat in a cafe in Miandrivazo I was joined by two men who ran river trips to the baobabs I was headed to. 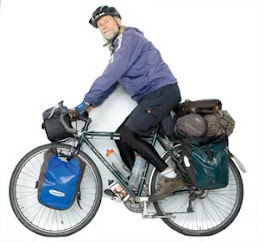 It was a three-day trip in a canoe and they said they could carry my bike. It was a tempting offer, though it was just four days into my biking and I wasn't quite ready for a respite, as I once was in Nepal when I had been biking for two months and was happy to have the leisure of a week on the Sun Kozi River without a worry in the world and being fed heartily, though the guides had never seen someone with such an appetite. These outfitters had just sent a party of eight Poles down the river this morning but had no one lined up for the next day. It would be just me and the oarsman and a cook, who spoke no English. If I had been a day earlier, spending three days with a bunch of Poles would have been hard to resist. The price of $250 wasn't particularly attractive. When I said I had been spending less than five dollars a day, they dropped their price to $150, but that wasn't the issue. I simply wasn't ready to sit in a canoe with the sun beating on me as I was still conditioning my skin to the sun. Plus I wanted to be riding my bike. 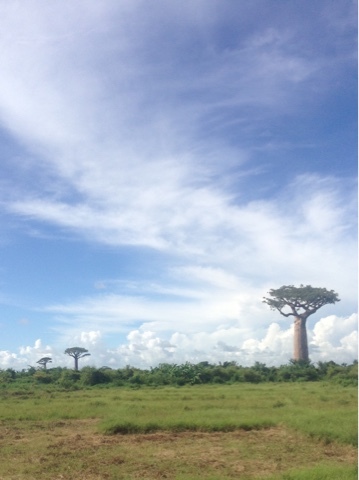 Two days later I closed in on the baobabs, just a scattered few at first, as the main avenue of them awaits me. They are stunningly otherworldly, either the goofiest or the most regal of the planet's arbors. They could be the creation of a wacky cartoonist or the vestige of an interstellar visit. They hardly seem as if they belong. It was tempting to camp amongst them but the Mozambique Channel, the 250-mile wide stretch of salt water that separates Madagascar from Africa was nine miles away. I was desperate for a swim, as I was becoming as ripe as many of those I pass on the road. I also needed to break my larger bills. It is almosg impossible to get change for 10,000 Ariary in the villages, a mere three dollars. The smallest bill is 100 Ariay, three cents. I have yet to encounter coins or anything cheaper than 100 Ariary. I have broken four of the larger bills already. I am camping at a complex of bungalows just off the beach and had a most welcome and luxurious swim. 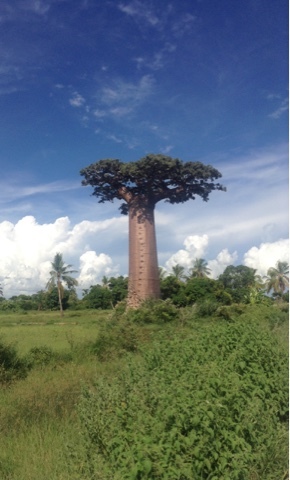 The Allée des Baobabs is eleven miles away. I'll be up early to catch them in the morning light. Is that a lion I can see on the crest of that knoll?? Not really - I can't see anything but grass but I wonder are there lions and tigers and bears there? Snakes? Monkeys? Other pests? Just wondering. That's what always comes to mind when I think of Africa. Madagascar sounds like the land that time forgot George. Good luck breaking those three dollar notes. Rick: As I mentioned towards the end of my first lengthy post from here, Madagascar has none of the large game of Africa, not even any of its primates. The lemurs are the largest animal. The only dangerous animal is a small panther. No venomous snakes to worry about.